Sometime this year, world public and private plus unfunded pensions will surpass $300 trillion. That is not even counting the $100 trillion in US government unfunded liabilities. Oops. These obligations cannot be paid. A time is coming when the market and voters will realize this. Will voters decide to tax “the rich” more? Will they increase their VAT rates and further slow growth? Will they reduce benefits? No matter what they decide, hard choices will bring political turmoil. And that, of course, will mean market turmoil. We are coming to a period I call “the Great Reset.” As it hits, we will have to deal, one way or another, with the largest twin bubbles in the history of the world. One of those bubbles is global debt, especially government debt. The other is the even larger bubble of government promises. The other is the even larger bubble of government promises. History shows it is more than likely that the US will have a recession in the next few years. When it does come, it will likely blow the US government deficit up to $2 trillion a year. Obama took eight years to run up a $10 trillion debt after the 2008 recession. It might take just five years after the next recession to run up the next $10 trillion. 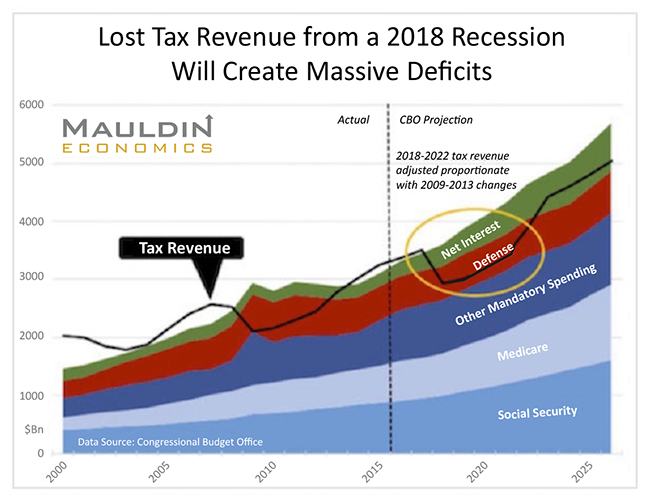 Here is a chart my staff at Mauldin Economics created in late 2016 using Congressional Budget Office data. It shows what will happen in the next recession if revenues drop by the same percentage as they did in the last recession (without even counting likely higher expenditures this time). And you can add the $1.3 trillion deficit in this chart to the more than $500 billion in off-budget debt—and add a higher interest rate expense as interest rates rise. The catalyst could be a European recession that spills over into the US. Or it might be one triggered by US monetary and fiscal mistakes. Or a funding crisis in China, or an emerging-market meltdown. Whatever the cause, the next recession will be just as global as the last one. And there will be more buildup of debt and more political and economic chaos. The Great Reset will also bring an increase in volatility. And the correlation among asset classes will once again approach 1.0, as it did during 2008–2009. If I’m right about the growing debt burden, the recovery from the next recession may be even slower than the last recovery has been. That is unless the recession is so deep that we have a complete reset of all asset valuations. I don’t believe politicians and central banks will allow that. They will print and try to hold on as long as possible, thwarting any normal recovery, until markets force their hands. But then, I can think of at least three or four ways that politicians and central bankers could react during the Great Reset. 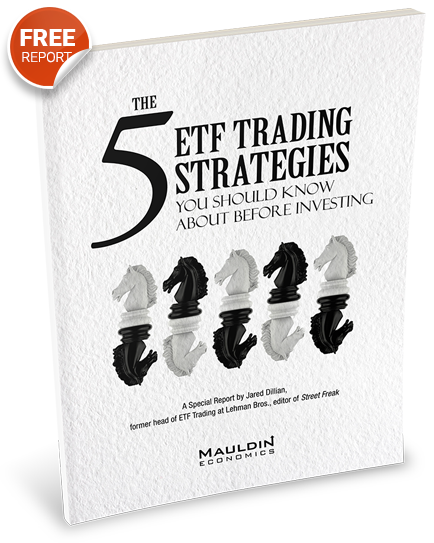 Each of the four ways will bring a different type of volatility and effect on valuations. Flexibility will be critical to successful investing in the future. I think the answer lies in diversifying among noncorrelated trading strategies that can invest in any asset class.